Meet the Trail Rated® Tough 2018 Jeep Wrangler JK, ready to explore whatever terrain you want to go on near Manchester and Nashua. The Wrangler boasts a power 3.6L Pentastar® V6 engine that reaches up to 285 horsepower and 260 lb-ft of torque. With available 4×4 systems, your Wrangler will turn into an acrobat while driving through the sand, mud, snow, and over rocks. We didn’t forget about the water element, which this Jeep Wrangler can go as deep as 30 inches! If you’re bringing something with you for your activities, you’ll enjoy your Jeep towing up to 3,500 lbs! This Jeep SUV is ready to test the limits and join you for any adventure you want. Available Command-Trac® or Rock-Trac® 4×4 Systems. Maximum towing of 3,500 lbs. Jeep has been giving individuals the freedom they deserve since its creation. The Wrangler maintains it heritage good-looks with removable top, doors, seven-slot grille, and dynamic round headlights. Manchester and Nashua area drivers can design your SUV to fit your lifestyle with MOPAR® accessories such as suspension lift kits, bumpers, rock rails, off-road light kits, and more. Your Jeep will dominate off and on the road with upgradable BFGoodrich All-Terrain KO2 tires. Relaxation will always be fulfilled with optional leather-trimmed upholstery and heated front seats. We know your explorations take you into unfamiliar territories.  At Contemporary Automotive, we want you to remain in constant connection with the world using Uconnect® technology. You can upgrade your system to include Navigation, ensuring you will never get lost! While on your excursions, you can listen to your favorite tunes from your available 6.5-inch touchscreen that includes SiriusXM® Satellite Radio, Bluetooth®, and more. You can maintain eyesight on the road by utilizing all these applications through steering-wheel-mounted controls. Upgrading your Jeep to feature Engine Block Heater and Remote Vehicle Start will help you stay warm during the brutal New Hampshire winters. Jeeps were built for WWII to assist soldiers storm the extremely dangerous Normandy Beach. Thus, they will maintain your protection on the Manchester and Nashua area roads. It begins at the foundation with high-strength steel. Wide-spaced frame rails protect the fuel tank between the wheels for added protection. Electronic Stability Control and Trailer Sway Control will keep you on a steady course. If an accident is unavoidable, there is an advanced multistage front airbag system installed while electronic roll mitigation will reduce the potential for wheel lift during severe or evasive driving maneuvers. Discover the fun and freedom you need with the 2018 Jeep Wrangler JK. To schedule a test drive, please contact us at (844) 500-6722.